The filter scarf is a discreet yet a highly effective gasmask that ensures a good quality of breathing air, wherever you are. It has two functions – detect and protect. A small electronic sensor reacts to air pollutants and warns the wearer. 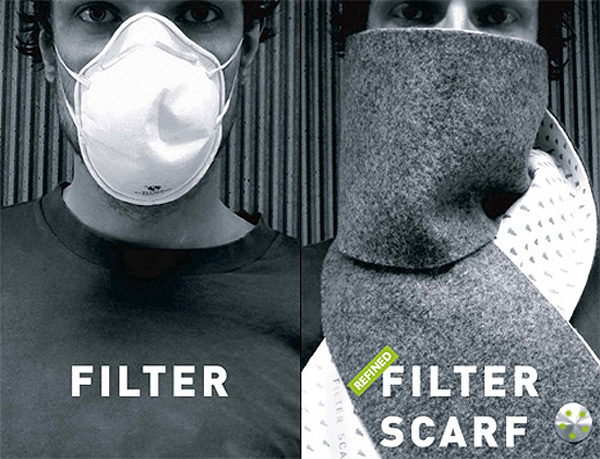 The scarf itself is lined with a carbon filter that absorbs the hazardous substances in the air. Filter scarf is lined with carbon filter that absorbs the hazardous substances in the air, (CO and NOx) leaving fresh air to be breathed by the user. The inside is a bright fabric printed with fresh trees. One side of the scarf is dark and the other is bright. This makes the feeling that the air goes from dirty to clean. After a while the filter turns full and then it is possible to wash the scarf in the laundry and use it again. Sensor – A small electronic sensor reacts to the most common air pollutants and warns the wearer of the scarf by sounding an alert. The sensor is placed on one corner of the scarf. It is round and is equipped five LEDs. When the concentration of pollution is too high the LEDs goes from green to red and makes a warning sound. When this happens the user knows that it is time to start breathing through the filter. On the other side of the scarf is a small round display that lets the user know approximately how much of the capacity if the filter that been used. The display makes it easier to know when it is time to put the filter scarf in the laundry.